May God bless you and your family in 2013. Many years back, more than 30 I was already studying the Bible prophecies. At the time it became apparent that the world at the time of the Tribulations would go into wars defined in geopolitical areas and all revolving around Israel and in particular Jerusalem. It was always understood by me that Satan was going to manipulate the political systems of the world to position his elect the Antichrist in a position of power and authority. In my reasoning at the time I saw that the two most powerful nations at that time were the USA and the Soviet Union and with the prophetical biblical background that I had acquired it was my conclusion that if we were in or near the end times approaching the Apocalypse the Antichrist was being positioned to take control of the biggest military system in the world. The role of Russia was easy to see as the Red Horse of the second seal and the Gog of the Ezekiel 38 prophecy. In Ezekiel Gog is defeated by God in the mountains of Israel and it shows the Nation of Israel burying the dead for seven months and living seven years from the spoils of war. This led to my conclusion that this Nation was not the one that the Antichrist was coming from. A prophetic dilemma was presented in that the prophet Daniel implied that the Antichrist would come from the people that destroyed the Temple and these were the Romans. It became clear to me that the USA was made up of mostly descendants from the Kingdoms of Europe and as such the people were descendants of the Roman empire. I concluded then and I still do that the Antichrist will come from the USA and we come to the present time where Barack Hussein Obama is the reelected president of the most powerful Nation in the world. It is the most powerful militarily, economically, scientific and industrial Nation of all the world. The article below covers only the military part, but it is enough to prove the point. The article by Mr. Tom Franks is very good and it shows in one place all the factors that make the US military the most powerful in the world. One thing that is missing from the article is the atomic power that is available to this country. 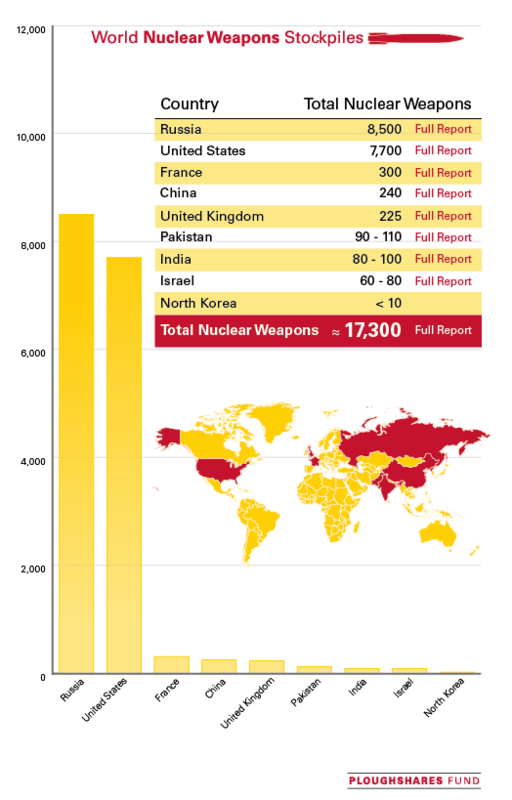 The exact number of nuclear weapons in global arsenals is not known. With little exception, each of the nine countries with nuclear weapons guards these numbers as closely held national secrets. What is known, however, is that more than a decade and a half after the Cold War ended, the world’s combined stockpile of nuclear warheads remain at unacceptably high levels. The role of the United States in Bible prophecy is something I wish the Bible would have clarified in further detail. Like most of the world, the United States is not specifically mentioned in the Bible. This very fact makes things very difficult for students and teachers alike as they attempt to pinpoint where this country will be at the End of this Age. Sure, it is easy to see how this country will be part of a one world system, but to be honest; I would love to see the amount of detail found in Ezekiel 38-39 for example. Several months ago I began looking deeper in an attempt to discover this mystery and I found nothing but speculation by ministers and experts alike. Some of what I found made a ton of sense, as various individuals tied in the United States to several prophecies. For example, here a few of the more interesting ones I came across. · The United States is the messengers and ambassadors or a tall and smooth skinned people located in Isaiah 18:2. · The United States is the great eagle that is found in Revelation 12:14. · The United States is the Mystery Babylon found in Jeremiah 50 and Revelation 17-18. · The United States is the villages or young lions located in Ezekiel 38:13. · The United States is the sword that can be found in Ezekiel 38:21. · The United States is the coastlands that are mentioned in Ezekiel 39:6. · The United States is the eagles wings found in Daniel 7:4. As you can see, there is a ton of guesses out there and as a result of this; I decided to take a different approach to this topic and its one that centers on the might of the US Military. At the forefront of military power, the United States of America is leading the way. Here are some figures based on 2011 numbers that I obtained from IISS (International Institute for Strategic Studies). As a disclaimer, I want to announce that I am all for having a powerful national defense, but some of these statistics are alarming when viewed through the lenses of scripture. · The United States accounted for 45.7% of all money spent on the military on the planet Earth. · The United States spent 8.2 times more than China,and 14.03 times more than Russia. · The United States spent 739 Billion dollars, which is more than the next 9 countries behind it, combined (487 billion). · The United States has more than 1000 bases worldwide. · The United States has a base in 150 countries throughout the globe. · The United States has around 1.5 million military personnel in foreign lands. · The United States has a military base on every single continent on Earth with the exception of Antarctica. These numbers are quite shocking and for good reason, there hasn’t been a nation in the history of this planet that has managed this feat. Oh, and by the way, these numbers do not include the massive amount of “lily pad” bases scattered everywhere that remain classified. For those that do not know, a “lily pad” base is a small launch point for Special Operations that are launched under classified actions. Going further, here is a global ranking on the US Military in specific categories based on data from 2011. Now while the US military is not leading the way in all categories, it is however significantly more powerful in offensive projection due to naval and air power. This means that the US military can go to any place in the world and sustain the conflict. With the United States and its ability to anywhere on the globe bring destruction down an adversary, what are some of the weapons they are going to be using? Here is a list of some of the weapons that are not only the most destructive on the planet, they possess a technological advantage that other weapons systems deployed by other nations. · The F-22A Raptor – A 5th Generation air superiority fighter that utilizes stealth, speed, maneuverability and advanced avionics that will provide the US an advantage over all other nations in air combat for the next few decades. There are approximately 196 aircraft in inventory with each one costing around $150 million per plane. Much of these airplanes abilities are classified. · The GBU-57 Massive Ordinance Penetrator – A 30,000 pound bomb that is capable of penetrating through 200 feet of concrete before detonating thus making it near impossible to hide from this weapon. There are 20 bombs in US inventory with program costing $314 million. The weapon is designed to be dropped by the B-2 Spirit stealth bomber. · The XM25 “Punisher” – A 25 mm grenade launcher that affords the US warfighter the ability to engage targets that are behind cover by air bursting the projectile over the enemy. The weapon system was deployed in Afghanistan in 2011 and approximately 41 are in service. In 2013, the US Military will begin production of 12,500 rifles at $25,000 each. Some of you might be thinking that given the state of the world’s economy and specifically the United States financial issues, the drive for military dominance would end. However, there are no plans to do so, and in a rare speech made from the Pentagon, President Obama declared that – “Our military will be leaner, but the world must know the United States is going to maintain our military superiority”. Two years ago, on April 10th, 2010, then Secretary of Defense Robert Gates declared that United States possessed a capability known as Prompt Global Strike. But before I explain what this system is, let us take a look at what the Bible has to say about how this world will be at the End of this Age. · I Thessalonians 5:3 (NIV) – While people are saying, “Peace and safety,” destruction will come on them suddenly, as labor pains on a pregnant woman, and they will not escape. So let me ask everyone this question – Where is this destruction going to come from? Keeping this verse in mind, allow me to describe what Prompt Global Strike is. In short, this system provides the US Military the ability to strike anywhere on the globe in one hour. This system includes the use of ICBM’s, hypersonic cruise missiles and a kinetic weapon system launched from space. In 2011, a test was conducted of the system as a missile was launched from Hawaii and struck a target in the Atoll Islands some 3,700 miles away. The entire sequence occurred in less than 30 minutes. I found this system very interesting because of what is found in Daniel 8. To those unfamiliar with this chapter, it predicts the arrival of the Anti-Christ and his destructive actions after he arrives. · Daniel 8:19 (NIV) – He said: “I am going to tell you what will happen later in the time of wrath, because the vision concerns the appointed time of the end. I – Here we have Gabriel beginning to explain the vision Daniel had by informing him that what he has seen will transpire at the end or time wrath. · Daniel 8:23 (NIV) – “In the latter part of their reign, when rebels have become completely wicked, a stern-faced king, a master of intrigue, will arise. · Daniel 8:24 (NIV) – He will become very strong, but not by his own power. He will cause astounding devastation and will succeed in whatever he does. He will destroy the mighty men and the holy people. · Daniel 8:25 (NIV) – He will cause deceit to prosper, and he will consider himself superior. When they feel secure, he will destroy many and take his stand against the Prince of princes. Yet he will be destroyed, but not by human power. I – In these verses we can see that the Anti-Christ will be responsible for worldwide devastation, only to be destroyed by Jesus himself at the end of the Tribulation. Some of you might be thinking that I am saying the United States of America will be the location in which the Anti-Christ comes out of. Daniel 12:4 states that no one will know the correct interpretation of the Book of Daniel until the end. So… what am I saying then? Well, regardless of what your stance is on the Rapture and unless the United States is wiped off the face the Earth, the US Military will exist at the time of the Tribulation and could be a part of the cause that causes worldwide destruction. This video is somewhere in this blog , but it is worth placing it again as the identity of Obama as the Antichrist is more and more becoming obvious for those Bible readers studying the prophecies of the end times. Thanks to Mary Anna for posting this today again. Well this day after the Mayan end of the world date of Dec 21, 2012 was uneventful just as yesterday was. It is not the Mayan prophecies that are important , but the Bible prophecies concerning the end of the age and the return of the Lord and Savior Jesus Christ to rule in the Millennium. Before we have referred you to Trudeau’s comic strip Donesbury about the Mayan apocalypse and he finished the tread today with this cartoon that makes lite of the whole thing. The whole world was caught up with the Mayan calendar ending predictions of destruction and a new era. Apocalyptic fever will soon die down and people will return to their daily routine live. Apocalyptic thoughts will not enter the minds of people as they have already been saturated with it and proven incorrect. So the world has become more difficult to see that the true destruction is just around the corner. Why do I insist on saying this and insist on warning people to turn away from sin and reach for the saving grace of Jesus. I believe the Bible and have studied it in as much depth as I could to know that it is true and believable. The study below by pastor F.M. Riley is a well written and in depth study of the future of mankind and the coming Apocalypse. I just read it and learned important concepts that have become much clearer than they were before. Last nite I watched the movie 2012 for the second time and was keenly observing the mixture of messages the movie was projecting in order to make an interesting and exiting picture. The Mayan, Aztec, Hopi were mentioned as well as the Biblical The End is Here Repent believers, and even what was happening was equated to the Rapture. No end time point of view was left behind, they were all introduced, shaken in the mixture and presented. Although it made an interesting movie it was part fantasy mixed with the prophetic truth shown in the Bible. Now the questions really are what is the true Apocalypse and what time is it in regards to its fulfillment? The first question can be discern in part from the article by F.M. Riley (below) and the second is that Israel is the key of Gods prophetic time. What do I mean by that? well the Bible states that Israel must be a Nation at the time of the Apocalypse as all the events of this time revolve around this nation and that Jesus said that the generation that saw Israel become a Nation again will see all these things (the Apocalypse) fulfilled. “But as it is written, Eye hath not seen, nor ear heard, neither have entered into the heart of man, the things which God hath prepared for them that love Him,” 1 Corinthians 2:9. There are many Scriptural details which I could point out in each of the time periods I have set before our readers in the two previous parts of this series of studies, but most of these details have already been covered in previous studies in “The Ages to Come” series. Those readers who want to study these details in more depth should request this series of studies. I am now going to set forth the major events listed in the prophetic Scriptures which will bring this present dispensation and age to an end, while ushering in the glories of “the ages to come.” May the Lord God give every reader grace, enlightenment, discernment, and blessing is my prayer for you……. The beginning of the seven year Tribulation period is also the beginning of “the ages to come” for all true New Covenant believers. However, in “rightly dividing the Word of Truth” [2 Timothy 2:15]the seven year Tribulation is also the last seven years of Old Covenant Law for Israel and the Jewish people. Many of God’s people today totally miss the truth that when Daniel was given the prophecy of the 70 Weeks, the Jewish people were living under the Old Covenant of Law, Daniel 9:24-27. The first 69 Weeks of that inspired prophecy were fulfilled to the letter on the exact day that the Lord Jesus Christ rode the donkey into Jerusalem and was proclaimed the “King of Israel” by His disciples, Matthew 21:1-11; Luke 19:28-44; John 12:12-16; Zechariah 9:9. Four days later, exactly as prophesied in Daniel 9:26, Christ was “cut off” and the “dispensation of grace” under the New Covenant intervened. This obviously leaves seven years of Old Covenant Law [the 70th Week] which has not yet been fulfilled by Israel and the Jewish people. There is no question that this is why the Lord Jesus explicitly told the Jewish people at His first coming, “Think not that I am come to destroy the Law, or the prophets: I am not come to destroy, but to fulfill,” Matthew 5:17. Therefore, the Old Covenant of Law will not be removed from Israel until the final 70th Week is fulfilled. The final 7 years of the Old Covennant of Law are the “appointed time” for the judgment of the Jewish people, exactly as prophesied over and over again in many Old Testament Scriptures. This truth may “blow the minds” of some readers, but even the judicial systems of the nations have recognized and acknowledged and even judicially ruled that “A Pardon is not “legally” a pardon unless it is willingly received by the person or persons being pardoned.” This is exactly why some people are saved and others remain eternally lost, even though the Lord Jesus Christ paid the sin debt for the whole human race. Unless one willingly receives the “pardon” Christ obtained for them by “grace through faith” they will never be saved, Ephesians 2:8-10; Titus 3:5. Israel as a nation and a people have stubbornly rejected the “pardon” [Colossians 2:14; Deuteronomy 18:18-19; Isaiah 55:7] which the Lord Jesus Christ obtained for them [and for all of mankind] at Calvary. The unbelieving Jewish people have refused to this day to even acknowledge any guilt in their rejection and crucifying of Christ. Right here read Hosea 5:15 and see for yourself what the Lord God Himself has to say about this matter in the Jewish Scriptures, and wake up to the truth! Therefore unbelieving Israel and the Jewish people are still under the Old Covenant of Law for seven more years [the 70th Week], and have a “Divine Appointment” to face judgment for that blasphemous sin against the Lord God with “the golden calf,” and also their rejection and crucifixion of their own God appointed Messiah and Savior. Have these sins been called to their attention? Yes! Thousands of times over the past 2,000 years. Now turn and read Hebrews 10:26-31. Their own Jewish Scriptures explicitly remind the Jewish people, “Be sure your sin will find you out,” Numbers 32:23. The inspired prophecies are quite plain that during the last half of the Tribulation every living Jew on earth will be physically removed from whatever nation and place they are presently “sojourning” in and will be bodily transported into “the wilderness” near the ancient city of Petra in the modern nation of Jordan, Ezekiel 20:33-38. Not one Jew will be left in any Gentile country on earth, Ezekiel 39:25-29. Notice verse 28! For more details of this great re-gathering of the Jewish people read Isaiah 11:11-12, 27:13, 43:5-6, Jeremiah 23:3, 29:13-14, 32:37, Ezekiel 11:17, 34:13, 36:24, 37:21, Micah 2:12, Matthew 24:15-21, 24:31, Mark 13:27, Revelation 12:6, and 12:14. In Ezekiel 20:34 it is explicitly stated that the Jews will be brought out “from the peoples” and gathered “out from the countries wherein ye are scattered…”. Then 20:35 explicitly states, “And I will bring you into the wilderness of the peoples, and there I will plead with you face to face.” This is the same “wilderness” that the Israelites wandered in some 3,500 years ago when they came out of the land of Egypt. But 20:38 really places the “clincher” on this truth, when the Lord God says, “And I will purge out from among you the rebels, and them that transgress against Me: I will bring them forth out of the country where they sojourn, and they shall not enter into the land of Israel: and ye shall know that I am the Lord.” The truth being set forth here is that these “rebels” and “transgressors” among the Jewish people will be bodily transported back from all over the world into the same wilderness that the children of Israel wandered in some 3,500 years ago, and there they will “leave their carcasses in the wilderness” because of their wicked unbelief, exactly as their unbelieving forefathers left “their carcasses in the wilderness” some 3,500 years ago. Now read again Solomon’s statement in Ecclesiastes 1:9-10 and 3:15 and marvel over the majesty and glory and wisdom and greatness and power of the Lord God of Israel and His inspired Word. Wow! Glory to God! Hallelujah! written in Tables of Stone, but rather they will trust in the Lord their God and follow His Law “written in the fleshly tables of their hearts” by His Holy Spirit. Glory to God! Hallelujah! Then the redeemed Jewish people, living in their natural bodies without a “sin nature,” will enter into the “inheritance” promised to them through God’s Covenant with Abraham nearly 4,000 years ago, and will live on the earth as a natural people before the Lord “for ever,” 2 Samuel 7:23-24; 1 Chronicles 17:21-22; Ezekiel 43:7; 43:9. Do any of these Scriptures [and many others I could refer our readers to] sound like redeemed Israel is ever going to cease from being a people before the Lord “for ever”? Every reader willing to deal honestly with God’s Word knows the answer. Think about it! Remember that “the wages of sin is death,” Romans 6:23! The seven year Tribulation period is also the “appointed time” [Acts 17:26] for the Lord God to destroy ALL of the incorrigible, rebellious, unbelieving, Christ rejecters living on the earth at that time, Acts 17:30-31; Romans 2:16. During the Tribulation God will take vengeance upon the wicked Gentiles [Romans 12:19] for their rebellion and rejection of the Lord God, and for every wicked thought, word, and deed, they have committed against the Lord’s people, whether His Jewish people or His Gentile “Christian” people, Hebrews 10:30-31; Genesis 12:3. At the end of the Tribulation, following the “Judgment of the Gentiles” [Matthew 25:31-46], there will not be one incorrigible lost person left alive on the face of the earth! They will ALL have been destroyed from off the earth, Psalm 37:1-2; 37:8-10; 37:14-15; 37:35-36; 37:38; Malachi 4:1-3. The earth will then and only then become a fit place for the redeemed people of God to live and serve the Lord in righteousness, holiness, and Godliness. Remember that the Lord God Himself explicitly stated, “And as it was in the days of Noah, so shall it also be in the days of the Son of man,” Luke 17:26. When Noah and his family emerged from the Ark on to the “new earth” following the flood, there was not a lost person left alive on the face of the earth! Read Ecclesiastes 3:15 again, and take it to heart! Just as the Jewish people are separated during the Tribulation, with only the redeemed Jewish people surviving the Tribulation, so there will also be a separation of the Gentile peoples, with only some believing Gentiles surviving the Tribulation. The Lord Himself explicitly states twice in the Scriptures that all mankind still alive on the earth at that time will see His glorious return to the earth as He comes back with all His Holy angels, Matthew 24:30; Revelation 1:7. See also Matthew 16:27, Mark 13:26, and 2 Thessalonians 1:7-10. There is a difference in the two descriptions of the Lord’s one return to this earth set forth in the Scriptures that many people appear to have completely missed. The coming of the Lord to resurrect and rapture His New Covenant believers to glory will occur SUDDENLY, “in a moment, in the twinkling of an eye,” 1 Corinthians 15:51-52. But the coming of the Lord at the end of the Tribulation [Revelation 19:11-21] will be slowly displayed across the heavens above the earth before His actual arrival. What a glorious and terrifying sight that will be for those alive on the earth at that time! There is no question in my mind that at that very time many Gentiles will cry out to the Lord for mercy and will be saved even as they see him coming in the heavens. Glory! We KNOW that there will be a “remnant” of the Gentiles saved at or near the end of the Tribulation, for such a “remnant” of Gentile believers will enter into the Millennial Kingdom in their natural bodies following the “Judgment of the Gentiles” in Matthew 25:31-46. These saved Gentiles in their natural bodies will repopulate the earth, ultimately becoming the Gentile “nations” on the earth from which “the kings of the earth” will bring the glory and honor of the nations into the New Jerusalem, Revelation 21:24-26. Praise the Lord! Glory to God! the New Testament. Check it out for yourself, Strong’s No. 1484. The so-called “Judgment of the Nations” in Matthew 25:31-46 is actually a judgment of the individual Gentile survivors of the Tribulation. Notice that the Lord Himself divides them into two different groups classified as either “sheep” [the saved] or “goats” [the lost]. At the conclusion of the judgment, the “goats” are cast “into everlasting fire, prepared for the devil and his angels,”[25:41], but the “sheep” enter into “the kingdom prepared for you from the foundation of the world,” and also “into life eternal,” Matthew 25:46. This strongly suggests that these saved Gentiles will live forever in their natural bodies, having been restored to the same sinless state that Adam and Eve were in before they disobeyed God and fell. It is these saved Gentiles of various nationalities; who will then repopulate the earth during the Millennial Kingdom, filling the earth with [Godly and righteous] nations. Glory to God! Hallelujah! Praise the Lord! But how could the redeemed survivors of the Tribulation, both Jews and Gentiles living in their natural bodies, repopulate the earth and establish a wholly righteous kingdom on the earth, unless the earth which Adam lost by his disobedience has been redeemed out of the possession of Satan, and has passed back into the possession of mankind? Oh, glory to God! I’m so glad you asked! Yes, I am laboring this point about the Law of God, because I am quite sure that the Law of Redemption for the Land set forth in Leviticus 25 and other Scriptures, was not an afterthought when the Lord God gave His Covenant of Law to Israel at Mt. Sinai. When the land was divided among the tribes of Israel every head of a household received a possession of land. By the Law of God that land was never to be sold out of the possession of the family or the heirs of the family. However, because God knows human nature, He knew that due to man’s own lack of good judgment, or due to some catastrophe, men would invariably lose their land. Therefore the Lord God made provision for men to sell [lease out] their land in the event of poverty or illness or some unforeseen catastrophe. However the land was to be returned to its rightful owner or his heirs in the year of Jubilee, Leviticus 25. But before the year of Jubilee arrived, the land could be “redeemed” back into the family by the owner who had lost it, or by one of his heirs who was a “kinsman.” See Ruth 3 – 4 as a Biblical example. Dear readers, this is exactly what happened at the dawn of human history! When Adam disobeyed the Lord, man’s “dominion” over “the earth…..and every living thing that moveth upon the earth [Genesis 1:28] was lost, and Satan became “the god of this world,” 2 Corinthians 4:4; 2 Peter 2:19. Everything that the Lord God had originally given to man in the Adamic Covenant passed into the possession of Satan. That wicked “fallen angel” has held sway over it for the past 6,000 years. order to “redeem” everything the first Adam lost by his disobedience to God, and to pay the sin debt of all of Adam’s race, Isaiah 53:1-6. Glory to God! Hallelujah! Thank you Lord Jesus! Now let’s go back, mentally or spiritually, to the time of our Lord’s arrest and subsequent crucifixion. Watch as our precious “Kinsman Redeemer” suffers the insults, blows, and beatings laid upon Him before He is nailed to the cross. Watch the Roman soldiers as they weave “a crown of thorns” plucked from a thorn bush growing in the soil cursed by God [Genesis 3:17-19] because of Adam’s disobedience, and place it on the head of the dear Lord Jesus, Matthew 27:29. Then watch now as our precious Lord is stripped naked and “a scarlet robe” [a robe worn by a king] is placed upon Him, Matthew 27:28-30. Watch now as the Roman soldiers bow their knees before Him, mocking Him and saying, “Hail, King of the Jews,“ 27:29. Watch as they take the “reed”[symbolizing a scepter] out of His hand and use it to “smote Him on the head,” 27:30. Cannot those of our readers who are true believers feel the agony and pain as the reed drives the “crown of thorns” deep into the flesh of His skull and face? Then watch as they strip the scarlet robe off of Him placing His own garments back on Him, and lead “Him away to crucify Him,” 27:31. Are you watching? Are you taking in the whole terrible scene? Then do you see it? The Lord Jesus Christ is still wearing “the crown of thorns” as He is nailed to the cross to suffer and die. Why is this important? Because He is not only dying to pay the sin debt of all humanity, but He is dying to redeem the earth itself from the curse placed upon it when Adam sinned. One day SOON now the earth will no longer bring forth “thorns and thistles” and other noxious and harmful weeds and plants. Remember that “the whole creation groaneth and travaileth in pain together until now,” and that “the earnest expectation of the creature [creation] waiteth for the manifestation [unveiling] of the sons of God,” Romans 8:22; 8:19. Christ bore earth’s curse on His own brow on Calvary as our precious “Kinsman Redeemer.” Oh glory to God! Hallelujah! Praise the Lord! Thank you Lord Jesus! Now read Isaiah 11:6-9, 35:1-10, 51:3, 55:12-13, 65:25, Ezekiel 34:25, Hosea 2:18, Amos 9:13, and many other similar Scriptures, and lift up your heart and voice and rejoice and give praise to our precious “Kinsman Redeemer” who wore that “crown of thorns” at Calvary as He suffered and bled and died on the cruel cross in our place. Glory! Thank you Lord Jesus! The Scriptures tell us explicitly that when Christ ascended back to the Father after his resurrection, He “sat down on the right hand of the majesty on high,” Hebrews 1:1-4. See also Acts 2:34, 7:55-56, Romans 8:34, Ephesians 1:20, Colossians 3:1, Hebrews 8:1, 10:12, 12:2, and 1 Peter 3:22. The Lord Jesus Christ has been at the right hand of our Heavenly Father throughout this present dispensation, directing the entire Kingdom of God [Matthew 28:18], and waiting for the “appointed time” to come back to receive His “bride” to Himself [John 14:1-3; 2 Corinthians 11:1-2], and carry out the rest of His ministry that is prophesied in the inspired Word of God. [Yes, I am well aware that our Lord’s ministry will never be finished!] Now let’s move forward to the seven year Tribulation period and watch our precious “Kinsman Redeemer” again……. Look now in Revelation 5:1 as a “book [scroll]…..sealed with seven seals” is introduced into the Heavenly scene. Look at the beloved John as he weeps bitterly “because no man was found worthy to open and to read the book, neither to look thereon,” 5:4. Watch the change in John as the angel tells him, “Weep not: behold, the lion of the tribe of Judah, the Root of David, hath prevailed to open the book, and to loose the seals thereof,” 5:5.
of and under the control of Satan and forever under the curse of sin. Can you even imagine the joy that must have swept through John’s heart and soul when our precious “Kinsman Redeemer” stepped forward? Glory to God! Hallelujah! Now watch as our precious “Kinsman Redeemer” steps before the Father’s throne in Heaven and takes “the book out of the right hand of Him that sat upon the throne,” 5:7. Watch now as at that very moment “the four beasts [living creatures representing the redeemed of Old Covenant Israel] and four and twenty elders [representing the raptured New Covenant believers] fell down before the Lamb, having every one of them harps, and golden vials full of odors, which are the prayers of saints,” 5:8. Listen as they sing the glorious “new song” of redemption, knowing full well that through the sacrifice of Christ they and the earth will be eternally “redeemed” and that they will “reign on the earth,” 5:9-10. Then in the next five chapters of Revelation, watch as our precious “Kinsman Redeemer” breaks the seals on the book and pours out the judgments in the first half of the Tribulationwhich are required by God’s Law to redeem the earth out of Satan’s possession and return it to the heirs of the original owners; redeemed mankind, the descendants of Adam and Eve. Oh, glory to God! Hallelujah! Praise the Lord! Thank you Lord Jesus! Praise your Holy Name! That our beloved “Kinsman Redeemer” accomplishes this redemption of the earth is clearly seen in Revelation 10, as John sees the Lord God at the middle of the Tribulation with the “little book open,” 10:1-2. Every requirement set forth in the Title Deed for redeemingthe earth has been met, and the earth and “every living thing that moveth upon the earth” reverts to the “legal possession” of our precious “Kinsman Redeemer.” As John watched this scene unfold, the Lord God cried out “with a loud voice, as when a lion roareth” while standing with one foot on the land and one foot on the sea and His hand lifted up to Heaven, 10:3-6. What is happening? The Lord God Himself is doing the same thing every explorer throughout human history has done when they have claimed a new land as their possession in the name of their God and their home country. Read the Scriptural record for yourself and rejoice and give glory to our precious “Kinsman Redeemer.” Glory to God! Hallelujah! Now read Revelation 11:15, which is also a mid-Tribulation passage. In this Scripture the “legal” claim of our “Kinsman Redeemer” is recognized and acknowledged by the Heavenly Father Himself. Precisely at the middle of the Tribulation when “the seventh trumpet” is sounded in Heaven, great voices in Heaven explicitly proclaim, “The kingdoms of this world are become the kingdoms of our Lord, and of His Christ; and He shall reign for ever and ever,” Revelation 11:15. Oh, praise the Lord! Lift up your voices and give glory to God! But whoa! Wait a minute! Something is still wrong! The decree declaring the ‘legality” of the Lord’s claim according to the Law of Almighty God has been upheld by Heaven itself, 11:15. So why doesn’t the Lord God immediately return and take possession of the earth? I would remind our readers that even Satan KNOWS Who is the Creator and Supreme Ruler of the whole Universe, James 2:19. In all of the wickedness perpetrated by Satan throughout human history, Satan has always been very careful to never directly oppose Almighty God or to go beyond what he knew Almighty God would tolerate. Satan does not want to be brought to judgment before the appointed time, Matthew 8:28-29. It is obvious that Satan must even ask God’s permission before he can lay his evil hands directly upon one of God’s children, or even upon their possessions, Job 1:6-12; 2:1-8.
is still in the Bible. Read Job’s experience and believe God’s Word! Now let’s look at the world situation at the middle of the Tribulation as it is set forth in the inspired Word. We know that the whole world system is presently in the possession of Satan, 1 John 5:18-19. The wicked men presently promoting the New World Order will have succeeded in establishing their long desired anti-God, anti-Christ, anti-Bible, one world government, Psalm 2:1-2; Revelation 13:1-2. Satan’s man [Genesis 3:15; Isaiah 14:12-16; Zechariah 11:17], the anti-christ, will have been exalted to world power, Revelation 13:3-8. Satan himself, through possession of “the beast” [anti-christ] whom he placed in power, will be receiving the “worship” and adoration he has so long desired, Revelation 13:4; 13:8. Many ofSatan’s evil goals among mankind through the centuries will have been achieved! Now how could Satan just meekly give up all that glory and power he has so long lusted after? Satan won’t! For the first time since his original rebellion against God and subsequent fall, Satan will blatantly defy the Law of Almighty God and refuse to honor the proven legal claim of the Lord Jesus Christ to this earth and all that is in it. Satan and all of his wicked followers will become “illegal squatters” on the earth, refusing to yield one square inch of it back to the Lord God, the rightful owner. Ho boy! This is when the real “fireworks” begin. It is at mid-Trib that God the Father Himself will literally “fly into a rage” and will say to His Son, “Sit Thou at My right hand, until I make Thine enemies Thy footstool,” Psalm 110:1; Matthew 22:44; Mark 12:3-6; Luke 20:42-43; Acts 2:34-35; Hebrews 1:13; 10:12-13. Notice that this prophecy occurs exactly seven times in the Scriptures, clearly indicating that it will be fulfilled at “the end of days” during the last half of the seven year Tribulation. The Hebrew word translated as “work” twice in this Scripture is the word “maseh.” This word literally means “ a work of judgment against the wicked.” See Gesenius Hebrew-Chaldee Lexicon, page 497, Strong’s No. 4639. The two Hebrew words translated as “strange” in this Scripture are the words, “zur” and nokri.” Both words literally mean “new; previously unheard of.” See Gesenius Hebrew-Chaldee Lexicon, pages 242 and 551, Strong’s No’s 2114 and 5237. In other words, this prophecy will be fulfilled by God doing a “strange work” that is totally out of character with His Divine Nature. What is the “normal” character or nature of Almighty God? Yes, this is a fair question for anyone who truly wants to know the truth to ask, and God’s inspired Word does give the answer. The inspired Word explicitly states in 1 John 4:8 that “God is love.” Therefore the “normal” character of God the Father Himself is “love.” Let this truth sink into your soul as you consider how very grieved the Father was when He saw the “hate” being poured out upon His own Son at Calvary, and yet was unable to intervene because of His “love” for your soul and mine. May our own souls be moved to deep grief, remorse, and worship of Him as we thank our Heavenly Father for the “love” He extended towards us at Calvary, John 3:16; Romans 5:5-8; 2 Peter 3:9. It was not only the Lord Jesus who was paying a terrible price for our salvation that day. The Father Himself was suffering as He watched His own precious Son suffer and bleed and die to pay for the sins of fallen mankind. Each of us are totally undeserving of such love, Isaiah 53:3-6; 64:6-7. Yet both the Father and the Son loved us anyway. Praise the Lord! Now look again at the passage in Isaiah 28:21. The Hebrew word translated as “act” twice in this Scripture is the word, “boda.” This word literally means “a work, effect, or fruit of righteousness in order to bring about quietness.” In other words, a work the Father Himself will do in order to bring an end to the sin, wickedness, and rebellion in the Kingdom of God. See Gesenius Hebrew-Chaldee Lexicon, page 600, Strong’s No. 5656. Glory to God! If every reader could see and feel what I am seeing and feeling right now, we would all lift up a mighty chorus of praise to our Heavenly Father and our precious Savior. Praise the Lord! Imagine if you can, how our Heavenly Father, who because of His own character and nature had to watch His own Son suffer and die at Calvary, and could not intervene because of His love and promises [Word] given to men [Genesis 1:28-30; 3:15], is going to feel when Satan, the very being who first introduced evil into God’s righteous kingdom, dares to defy God Himself by refusing to honor the Lord’s proven “legal” claim and return possession of the earth back to our “Kinsman Redeemer.” [Yes, I KNOW this is a long sentence! I’m writing to proclaim and uphold truth, not so-called “scholarship.”] Yes, the Heavenly Father, the Supreme Ruler of the whole Universe, is going to be a wee bit angry and may even loose His “cool.” How thankful I am, that by the grace given to me through faith in the Lord Jesus Christ, I’m on God’s side and in His corner. It is not then just “coincidence” that right at mid-tribulation one of God’s angels flies through “the midst of heaven” [the sky above the earth] announcing to mankind living on the earth at that time, “…..Fear God, and give glory to Him; for the hour of His judgment is come:…,” Revelation 14:6-7. The remainder of the 14th chapter then sets forth the “reaping” of “the harvest of the earth” during the last half of the Tribulation. Notice also in this chapter the explicit statement that “the wrath of God…..is poured out without mixture into the cup of His indignation…, 14:10. Folks, I am sure those who teach the silly “pre-wrath rapture theory” will not appreciate my pointing out this truth, but there has never been a time since Adam fell that the “wrath of God” was not being poured out upon the wicked, just as it has been, and still is, throughout this present “dispensation of grace,” John 3:36; Romans 1:18; Ephesians 5:6; Colossians 3:5-6. What many fail to notice is that throughout human history “the wrath of God” has always been mixed with the mercy of God. Yet the last half of the Tribulation is the “appointed time” for God’s “wrath” to be “poured out without mixture” during the time required for the “seven golden vials [bowls] full of the wrath of God” to be poured out, Revelation 15:7-8. What this means is that no lost person can even be saved during the last half of the Tribulation, until the final seventh bowl of God’s “wrath” has been poured out. Doesn’t Revelation 15:8 explicitly state, “And the temple was filled with smoke from the glory of God, and from His power; and no man was able to enter into the temple, till the seven plagues of the seven angels were fulfilled”? It doesn’t take much of a Bible student to understand that the Temple of God in Heaven is the location of the true “mercy seat,” Hebrews 9:1-5; 9;22-24. Then if “no man” can enter the Temple until all seven of the bowls of “God’s wrath” are poured out, it should be obvious that “no man” can come to the “mercy seat” in order to obtain mercy during that time. Is this truth just too hard for some to comprehend? Once the last bowl of “wrath” has been poured out, then and only then will men be able to find mercy again in the saving of their soul. Imagine if you can, living on the earth during the last half of the Tribulation when one “plague” [bowl] of God’s “wrath” after another is being poured out [Revelation 16:1-17] upon wicked Christ rejecting humanity, and there is not one act of mercy extended to any lost person on earth during that time. Yet today, some who “profess” to be “Christians” are so Scripturally illiterate that they not only teach that everyone must go through the Tribulation, but some of them are even “looking forward” to going through it. May God have mercy on such IGNORANCE! A careful study of Revelation, chapters 15-19, and many other related prophecies in both the Old and New Testaments, reveals that the kingdom of the anti-christ [Satan’s kingdom on earth] and all of his wicked followers will be brought to total destruction. Millions [or billions…?] of the incorrigible wicked will die during the final terrible last half of the Tribulation as the righteous judgment and “wrath of God” is poured out upon sin loving, God hating, Christ rejecting humanity. In eternity past, after Satan had rebelled against God and was “arrested,” tried, and condemned, he was released on appeal just as in any proper judicial process. Satan was promised back then that he would be given a “final hearing” at the “appointed time.” The Lord God always keeps His Word. The “appointed time” for final judgment of the spiritually “dead,” both human and angelic, is at the end of 7,000 years of human history. It is not at the end of the Tribulation. Therefore during the 1,000 years Millennial Kingdom, Satan will be imprisoned in “the bottomless pit” to await his “final hearing” a thousand years later. While he is imprisoned in the pit during the Millennial Kingdom, he will not be able to influence or deceive any human being on the earth during that time, 20:3. Hallelujah! Praise the Lord! If our readers will carefully study Revelation 18, the chapter deals with the final destruction of the literal city of Babylon located in the present nation of Iraq. The literal city of Babylon will be rebuilt during the Tribulation period and will become the Gentile capital city of the whole world, from which the anti-christ will reign over the “ten kingdoms” during the last half of the Tribulation, Isaiah 14:3-4; Jeremiah 50 – 51, Zechariah 5:5-11; Revelation 17:12; 17:15-17. Now look carefully at Revelation 18:2, “And he cried with a strong voice, saying, Babylon the great is fallen, is fallen, and is become the habitation of devils [demons], and the hold [prison] of every foul spirit, and a cage [prison] of every unclean and hateful bird [fallen angels].” The words “hold” and “cage” in this Scripture are translated from the exact same word in the Greek text. The Greek word is “phylake,” which literally means “prison.” See Thayer’s Greek Lexicon, page 659, Strong’s No. 5438. Both the fallen angels and the demon spirits will be “imprisoned” during the Millennial Kingdom in the city of Babylon, beneath the waters of the sea which will come up from the Persian Gulf and literally cover the site of Babylon, Revelation 18:21; Jeremiah 51:63-64. Therefore no fallen angel or demonic spirit will be able to seduce, deceive, or influence any man during the 1,000 years Millennial Kingdom. Glory to God! New Covenant believers, those who are truly saved by grace, will be in Heaven with our Lord and Heavenly Bridegroom during the seven years of the Tribulation. We will have been resurrected and raptured to glory prior to the beginning of the Tribulation, 1 Thessalonians 1:10; 5:9; Revelation 3:10. During the seven years in Heaven we will not be idle. A number of events are set forth in the Scriptures for New Covenant believers during that time…..
the Talents and The Parable of the Pounds as found in Matthew 25:14-30 and Luke 19:11-27. Both of these parables give insight into the “bema” judgment of believers. The Marriage of Christ and His Bride…….Following the “bema” judgment, the marriage of Christ to His presently “espoused” Gentile bride; His church, will occur, 2 Corinthians 11:1-2; Ephesians 5:22-32. In spite of what some teach today, there is a direct connection between the “bema” judgment and the marriage. Keep in mind that the “bema” judgment will glaringly reveal the faithfulness of every true believer [or the lack of it]. Christ will not be marrying an “unfaithful bride.” Let every true believer take this to heart! Just because you are saved, and perhaps even a member of a Bible believing church, does not mean that you will be a part of the bride of Christ. How much do you really love the Lord? How faithful are you in serving Him? If any reader objects to my asking these questions now, then what will be your answer when the Lord Himself asks them of you at the “bema” judgment? Think about it! If even a true believer does not love the Lord enough in this present life to live for Him daily, to study and uphold the great truths of His Word, to pray in His name, to witness to others about Him and for Him, to seek to obey His commandments, and to seek His will for their life, what in the world gives them the idea that they will be in “the bride of Christ”? Whether some like it or not, the Word of the Lord clearly divides God’s people into two groups, the “bride” and the “guests, at the wedding, Matthew 22:10-11. The “guests” are obviously not the bride! Now which group do you want to be in? Do you want to simply be one of the “guests” at the wedding? Or is it the fervent desire of your heart to be a part of the “bride” because you love the Lord with an intense love and devotion, and seek daily to allow Him to direct your life, and seek daily to devote yourself to carrying out His will in and for your life? Just how much does the Lord Jesus Christ really mean to you? Since Christ in His humanity is the “Lion of the tribe of Judah, the Root of David” [Revelation 5:5]; a Jew, there is no question that the marriage will be patterned after the traditional Jewish marriage customs. The Gentile bride in this case will be marrying her Jewish Bridegroom. This study is too long already, so I will not take the time here to set forth the beauty and symbolism of the Jewish marriage. I would urge every reader to research the Jewish marriage customs. Also study Psalm 45, The Book of Ruth, and The Song of Solomon in order to see what lies ahead for New Covenant believers in “the ages to come.” Glory to God! The Glorious Return…..After a beautiful seven year “honeymoon” in Heaven, we New Covenant believers will return to this earth with our precious Heavenly Bridegroom to subdue and reclaim the Kingdom that rightfully belongs to our Lord, and to redeemed mankind, Luke 19:12. Thereby the earth will once again be in the possession of redeemed mankind, exactly as it was before Adam’s fall, Zechariah 14:5, 1 Thessalonians 3:13, and Revelation 19:11-14. Keep in mind that this reclaiming of the earth will not be the end of God’s great plan for redeemed mankind, but it will rather be just the beginning, James 1:18; Ephesians 2:4-7; Romans 8:18. Don’t miss it for the world! After returning to the earth with Christ, New Covenant believers will take up the positions assigned to them as “kings and priests,” ruling and reigning with Christ over the redeemed peoples living on the earth in their natural bodies. This alone will be “glory” for God’s New Covenant believers, but it is just the beginning……. The Eternal Ages to Come…..
earth, so Satan’s angels also oversee and administer Satan’s kingdom on earth. This is why New Covenant believers are explicitly told, “For we wrestle not against flesh and blood, but against principalities, against powers, against the rulers of the darkness of this world, against spiritual wickedness in high places [the heavenlies],” Ephesians 6:12. There is a spiritual war raging in and around us all the time, and the battlefield is the hearts and minds and souls of mankind upon the earth. Every true believer should know that Satan was created as an angel; one of the order of angels spoken of in the Scriptures as “cherubs” or “cherubim,” Ezekiel 28:11-19. Yet by his own freewill Satan made the choice to raise an insurrection against God and succeeded in persuading one-third of the angelic hosts to follow him in his wickedness. Because it was an angel who introduced sin into God’s righteous kingdom, the Lord God is going to take the administration of the earth out of the hands of angels, and place it in the hands of His “born again” New Covenant believers, Hebrews 2:6-13. This will guarantee that there will never again be a repetition of Satan’s rebellion in all of the eternal ages to come, for God’s Kingdom will be overseen and administered by “the sons of God,” Romans 8:14-17. Now go back to Part 1 in this series of studies and look on pages 7 & 8 to review what has been imparted to and implanted within every true New Covenant believer. Then once the body of every New Covenant believer is “changed” and made like the “glorious body” of Christ Himself [1 Corinthians 15:51-52; Philippians 3:20-21; 1 John 3:2-3], we will be rid of our present “sin nature” “for ever,” and it will be impossible for us to cheat, lie, lust, hate, murder, or commit any kind of sin. Why? Because in being “born of God” we have received “the mind of Christ” and have been made “a partaker of the divine nature” of Almighty God Himself, 1 Corinthians 2:16; 2 Peter 1:2-4. Oh, glory to God! Praise the Lord! By His own Divine Nature “God cannot lie,” Titus 1:2; Hebrews 6:18. “…for God cannot be tempted with evil,” James 1:13. “This then is the message which we have heard of Him, and declare unto you, that God is light, and in Him is no darkness at all,” 1 John 1:5. Dear reader, this is the “divine nature” that was implanted into the soul of every true New Covenant believer at the time we received Christ as our personal Savior and were “born again” [born from above]. Therefore just as it is impossible for God to sin, so it will be impossible for New Covenant believers to sin once we receive our new bodies made in fashion “like unto His glorious body, according to the working whereby He is able even to subdue all things to Himself,” Philippians 3:21. Glory to God! Hallelujah! Praise the Lord! Now do our readers who are true believers understand why the Book of Hebrews repeatedly states that those believers who have received Christ under the New Covenant have “a better hope” [7:19], “a better covenant” [7:22], “better promises” [8:6], “better sacrifices” [9:23], “in heaven a better and an enduring substance” [10:34], “a better country” [11:16], “a better resurrection” [11:35], a “better thing” [11:40], and “better things” [12:24]? It is then a Scriptural truth that “the world to come” will not be placed under the administration of angels, but rather it will be under the administration of the “new man” who is being “created in Christ Jesus” as a special “kind” of man [James 1:18] for the express purpose of ruling and reigning with Christ Jesus over the whole redeemed creation. Hallelujah! Glory! works of the Lord’s “hands”? The last time I checked, the “fingers” were certainly a part of the “hands.” Hello! Throughout human history mankind has had a desire to soar into the heavens. This is no better seen than in the “space programs” of modern man. But whether men like it or not, the “heavens” are currently “off limits” to fallen mankind. Read it for yourself in Psalm 115:16. Men today are “intruders” and “trespassers” in the heavens. But will the Lord God ever permit mankind to go out into the vastness of the heavens? Of course He will! It doesn’t take a rocket scientist or a brain surgeon to understand that Psalm 8 and Hebrews 2 explicitly place “the heavens” under the dominion of redeemed mankind in “the ages to come.” Glory to God! Hallelujah! Praise the Lord! In the “ages to come” the new earth [Revelation 21 – 22], even with “no more sea,” will one day fill to capacity. Then the Lord God will reach out into the present solar system, or even far beyond, and select another planet or planets for redeemed mankind to colonize, and as the Scriptures explicitly state, “Of the increase of His government and peace there shall be no end, on the throne of David, and upon His kingdom, to order it, and to establish it with judgment and with justice from henceforth even forever. The zeal of the Lord of hosts will perform this,” Isaiah 9:7. There is also no question that the Lord God will also select one or more “glorified saints,” “new creations in Christ” presently being createdunder the terms of the New Covenant to rule and reign over the colonists who immigrate to and populate the new planet. Again, why a “glorified saint” to be the ruler? In order to guarantee that what happened in eternity past when Satan and his angels rebelled against the Lord, will never happen again in all of the eternal “ages to come.” Glory to God! Praise the Lord! Glory! Glory! Glory! There is so much more to this subject, but I must close this series of studies. I have set forth many more details in my series entitled “The Ages To Come,” of which these three current studies shall become a part. I will be glad to send the entire series to any reader upon request. What I hope has been achieved in this study is to give our readers just a little glimpse of what yet lies ahead for all of God’s redeemed people in “the ages to come.” It is is my desire to encourage every reader to seriously study God’s wonderful inspired Word, and to “make your calling and election sure,” 2 Corinthians 13:5; 2 Peter 1:10. I want to meet every reader in glory at the resurrection and rapture of New Covenant believers. Please don’t disappoint me! Further, when each true believer became a Christian by receiving Christ into their heart and soul, even though we may not have realized it at the time, our precious Savior and Lord set our feet on the path of the greatest adventure that mankind will ever experience. I love adventures! Folks, get into the adventure God has prepared for all those who love Him, and enjoy it to the fullest! May God grant to every reader the GRACE you will need for the adventure. A very powerful testimony of a life that was destroyed which was brought back from destruction by the Holy Ghost and Jesus. Thanks to Mr. Jim Bramlet for this video link. Powerful, powerful testimony of Carol Komacki. Highly recommended. 16 minutes. To keep the trend in this prophecy blog and present all sides to the theme I am introducing today’s Doonesbury cartoon who true to form continues the theme of the Mayan end of the world started two days ago. My 27 year old son is planning to have a party on Saturday the 22 and is roasting a 45 # pig in a caja china roaster. Well I do not think the world will end Friday as many Mayan prophecy followers think, but I would not be doing a party to celebrate either. What I believe all these ancient civilizations were saying and expecting is the return of the gods they worship in the case of the Mayans Quetzecoatil Kukulcans and the Aztecs and the Hopi etc. I am expecting the Antichrist to reveal himself to the world and the Apocalypse will start. Could this happen as the Mayan’s gods (Fallen Angels) prophesied giving credence to their demonic inspired religions? My last post was about who I believe is the Antichrist! GB Trudeau is good in grabbing the spirit of the society trends of the moment and acting it out in his cartoons. In this he is brilliant.